Cátedra Unesco. UNESCO Chair on World Language Heritage. This Chair was created by Unesco in collaboration with the UPV-EHU (University of the Basque Country). 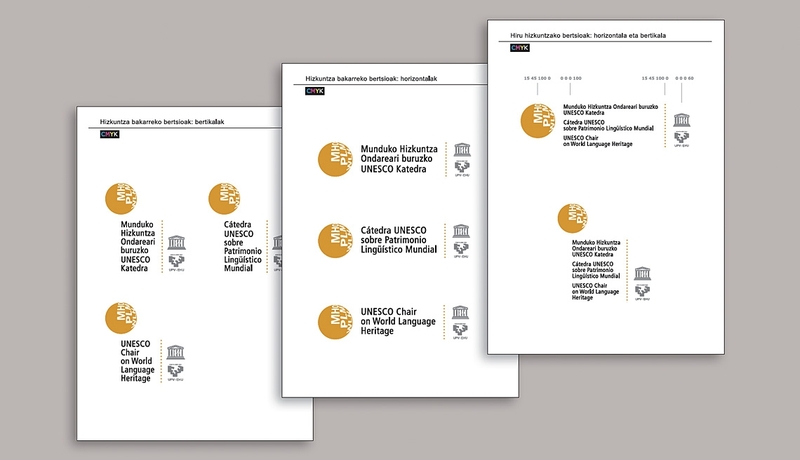 “Munduko Hizkuntza Ondareari buruzko UNESCO Katedra” (MHO), “Cátedra Unesco sobre Patrimonnio Lingüístico Mundial” (PLM) and “UNESCO Chair on World Language Heritage” (WLH) are the names of this Chair in the three languages used on its communications. We use one of them depending on the target. But sometimes it was necessary to use the three long names as well as the logos of the two sponsors (see slide).